You’ve been summoned to the Court of the Cash Kings to entertain these royal figures. Click here to play! See if you can charm these rulers for a chance at a very handsome payout indeed. You’ll want to start off your bid for riches beyond belief by seeking out the Kings of Cash logo. This symbol will bring in a very large payout if you can spin two to five of them across an active payline. In fact, you could earn up to 5,000 times your line bet. It’s also a wild symbol that will replace others to help you in your quest for major payouts. Next, seek out all four kings of the court. Each of these royal men will reward you in a big way if you can spin them across the reels. Three to five of any of these jolly rulers will bring in a top win worth up to 300 times your line bet. Other symbols to look out for while you’re roaming the court include treasure chests, royal thrones, and royal shields as all three will bring in some decent wins. The game also features two scatters, both of which will multiply your total bet. 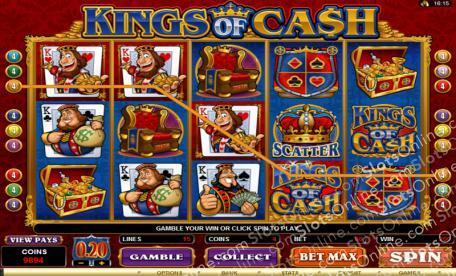 Plus, the crown will trigger a bonus round while the cash symbol will trigger a number of free spins. So, spin the reels to enter the royal court of the Cash Kings to see if you can charm some cash out of these generous rulers. There are two scatter symbols in this game. The first is a gem encrusted crown. Spin three or more of this symbol anywhere on the board to multiply your total bet. It will also trigger a bonus game. The second symbol is a golden cash symbol. Spin three or more anywhere on the board to multiply your total bet and trigger a number of free spins in which all payouts are doubled. The Kings of Cash logo is a wild symbol. It will replace all others except the scatters to help create more winning lines. Spin three scattered crowns anywhere on the board to trigger the Kings of Cash Bonus round. This game will have you choosing from a selection of cards. Match four kings of a kind and you'll take the bonus payout associated with that king.